Can you remember the letters you have written and received in your life? The news, the joy, the ups, the downs… the bills, the love letters..? Well, as Valentines Day approaches I am introducing my own book of Love Letters to the world… As a coach, consultant and trainer – I’m on a mission to share the simple process I went through – to heal, enjoy and love my life and in doing so – support others to do the very same. My intensely personal letters entertain, emote and are written in my own, often poetic voice. 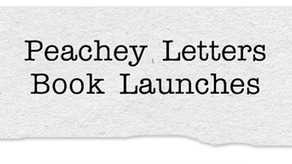 Peachey Letters – Love Letters to Life is my exploration and celebration of love in all its’ mysterious aspects. In it I write to the people, phenomena and happenings that have touched my life – in ways tremendous and trivial. It all started as my Peachey Letters Blog, where I analysed, let go and celebrated my own crazy and amazing life; along the way becoming my own best coach. The Blog has already reached out to thousands of people around the world, many of whom have been inspired to resolve issues in their own lives and to write their own ‘love letters’ too.The unprecedented response I have received (See some of the feedback here…), means that Blog now becomes Book and so I am inviting you to TWO Launch Events to welcome Peachey Letters into the world. The London Book Launch is the first official event – all are welcome, you just need to register your place on-line, at the link below – you can also opt to purchase an advance copy of the book which you can collect on the evening. Lucie Bradbury – Founder of Damsels in Success will be introducing both events, other speakers are to be confirmed. The Leamington launch is combined with fund raising for Parkinsons, the condition that my mother lived with for over 15 years. She passed away in July 2012 during the writing of my book and so this launch is dedicated to her. The money raised will go to Parkinson’s UK – to support and research into this debilitating neurological condition.The two events have been created to be two different experiences – do feel free to register – for one, the other or both. Cost: Entry Free or pre-buy your author signed book for just £10.00 (retail £11.99), as well. Like all good parties, you are asked to RSVP – so please confirm your attendance by following one of the links above and securing your place. If you are unable to join me at either of the launches, then you can still purchase your own copies of the book, at the special pre-publication price of £10.00, up until the second launch date, (when the prices increase to the cover price of £11.99 and p&p will also be added) or from Amazon and at all good book shops at full price! I do hope you can join me for what will be two extra-ordinary events in this Peachey life.